Coin hunting or coin shooting is a popular hobby all over the world. Coins have been in circulation since before the time of Christ. Unfortunately, many of these coins (and jewelry) are usually lying in the midst of large amounts of metal trash such as nails, aluminum foil, bottle caps, etc. Most coinshooters just want to recover coins, rings and other jewelry and not waste time digging trash targets. Some Fisher machines are better than others at telling you what's buried below the dirt. To avoid becoming discouraged by digging too much junk, select a detector with good discrimination that can effectively identify a large portion of worthless junk in the ground. Although some successful coin shooters use discriminating detectors without target ID, but if your budget allows, purchase a unit with a digital readout or a meter. Consider at some point also buying a second, smaller coil for use in hunting trashy areas. Smaller coils have better separation and work well in trashy areas. Recommended Fisher detectors for Coin Shooting and Jewelry are the F75, F70, F19, F5, F4, F2, F11, F22, and F44. For the serious relic hunter, the three most important factors are depth, depth and more depth. Revolutionary War, Civil War, and War of 1812 artifacts, as a general rule, are usually much deeper than modern coins and are quite often found in rough terrain such as woods, overgrown areas, croplands and pastures. Artifacts in plowed fields can be quite deep. Unexploded artillery shells can be several feet deep. At a minimum, your detector must be able to detect a target 10 inches deep, or you may not recover anything. This is a different type of need than that of the typical coin shooter. While coin hunters normally discriminate against all types of iron, most relic hunters want to find iron objects because they can be cannonballs, artillery shells, bayonets, gun tools, weapons, as well as non ferrous bullets, buttons, buckles, spurs, etc. Discrimination and target identification are a plus in relic hunting but are not a necessity. Because depth is SO important, you must have a machine that can cancel out ground mineralization with manual adjustments. Avoid machines that have factory preset ground balance because ground conditions can vary widely and you will need a machine that you can adjust to these various conditions. Get a machine with a manual ground balance adjustment. Use headphones to help hear deep targets and get the largest coil available to get maximum depth. Keep in mind that the use of metal detectors on National Park Service properties is strictly prohibited anywhere in the USA. Some state parks have this restriction as well, so always check local laws in advance. 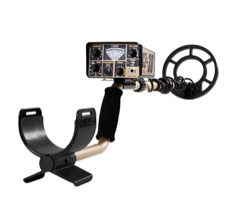 Recommended Fisher detectors for Relic and Jewelry Hunting include the CZ-3D and Gemini 3 deep seeking detectors, as well as F75, F70, F19, F5, F4, F2, F11, F22, and F44. Metal detectors that operate well in salt water are generally higher priced than multipurpose detectors, but they are definitely worth the extra investment if you frequent the ocean in search of modern jewelry and coins (although some beaches can yield historic artifacts as well). Salt water beaches present special problems (mineralization). Wet salt makes the ground conductive. All metal detectors work well in the dry ocean sand, but can become erratic in the wet salt sand or in the surf because it sees the sand as a large sheet of metal. This is why if you plan on hunting salt water areas often, it is wise to invest in a machine designed for those conditions. Beach hunting can be done on the dry sand or out in the water where many rings are lost, so you must determine if you will only shallow wade (with just the coil under water) or desire a totally submersible machine suitable for deep water wading or diving. If you only plan to hunt dry sand and very shallow water, a good coin shooting detector will work well if you keep the discrimination set low. If you wish to go out into deeper water you will need a totally submersible machine. All quality metal detectors have submersible search coils, but not all control boxes are waterproof or suitable for the pressures of deep water diving. In all types of beach hunting, the discrimination must be kept very low, eliminating only small iron (bobby pins and nails). Aluminum pull tabs and tin foil should not be discriminated or you will lose some gold and/or platinum rings as well. Use of a sand scoop will make target recovery fast and easy. Some machines have a single tone for all targets and some have variable tones for different targets. It’s important to realize that most gold rings will read in the “middle” tones (above iron but below coins). In summary, keep your discrimination levels low, tonal ID gives you an advantage, and purchase a fully submersible machine if you wish to hunt deeper water. Recommended underwater detector is the Fisher 1280X. 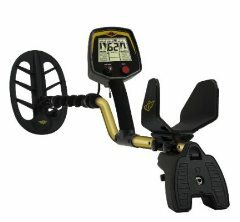 If you are really serious about prospecting with a metal detector you should consider purchasing an instrument designed specifically for that purpose. Your success rate will be much higher if you do. Gold detectors are not necessarily higher priced, but they are highly efficient at the task. Nearly any machine will find a gold nugget if it is large enough, not too deep and not in highly mineralized soil. But since gold is generally found in highly mineralized soils, such as black sand, you will need a detector that normally operates at a higher frequency than most detectors because gold responds better to the higher frequencies. To detect gold effectively in extreme ground conditions, you need a machine that can balance out the high mineralization and maintain stability with a smooth threshold tone. Otherwise, small nuggets will not be detectable. In addition, special coil types are used on gold machines that enable the machine to cancel out the affects of the black sand. 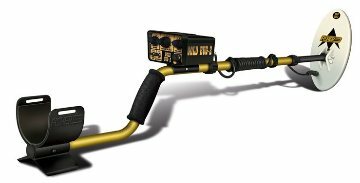 Recommended Fisher Metal Detectors for Gold Prospecting are the various Gold Bug models. Shop for Fisher Metal Detectors.